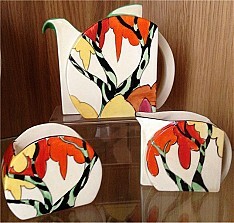 Clarice Cliff was born on January 20th 1899, in Tunstall, Stoke-on-Trent. She began work at the age of 13 as a gilder in the Staffordshire Potteries, adding gold to traditional ware. Clarice later began studying art and sculpture in the evenings, to develop her skills. 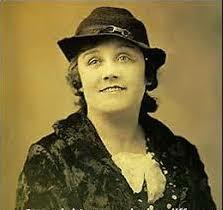 In 1924, at the age of 25, Clarice undertook an apprenticeship in the AJ Wilkinson's pottery factory in Staffordshire. By 1927, Clarice had been given her own studio, in recognition of her talent, where she began adding freehand patterns to defective 'gloss' pottery, covering imperfections with coloured triangles. This style she called 'Bizarre' and it was immediately snapped up by the company's stockists. Due to the popularity of the Bizarre range, which now had its own stamp 'Hand Painted Bizarre by Clarice Cliff', Gladys Scarlett was brought in to help Clarice paint the designs. Clarice's designs took on a more 'moderne' angular and geometric influence from 1929, in line with, what was later termed, the 'Art Deco' trend. Clarice's 'Crocus' pattern, launched in 1928, was so successful that by 1930, a team of twenty women were employed to paint the design to keep up with demand. 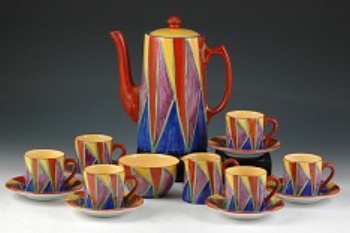 Clarice was made Art Director of Newport Pottery and A J Wilkinson in the same year. During WWII, production of Clarice's brightly coloured pots ceased when manufacturing restrictions meant only plain white 'Utility' ware was allowed to be produced. After the war, tastes had changed to a more conservative, formal ware; the heyday of Clarice's creative work was over. The factory continued to produce pottery bearing Clarice's name until 1964. 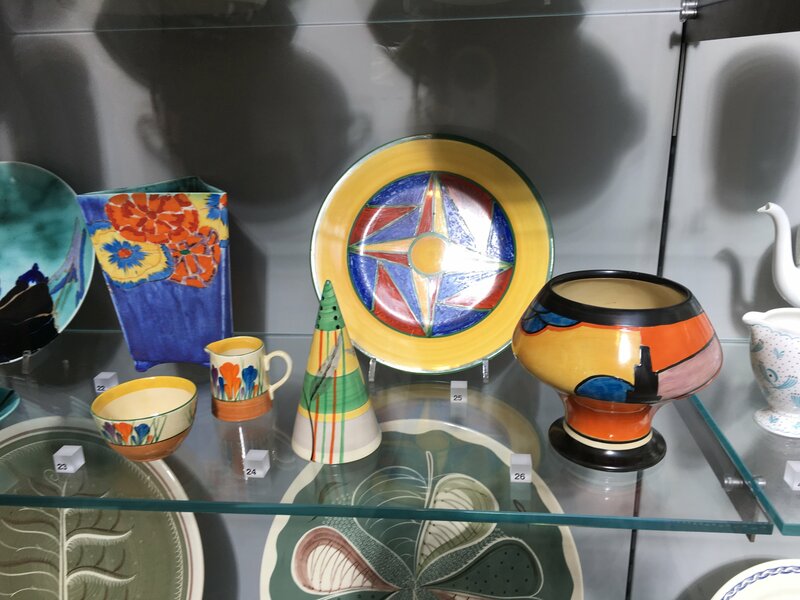 In 1972, the first Clarice Cliff exhibition was held in Brighton, England, but sadly Clarice did not live to see the revival of interest in her work, as she died suddenly in the October of 1972. Clarice enjoyed unparalleled success and fame for a woman in the 1930s and she is remembered today as a pioneer and major artist of her era. Her work is highly sought after and collectable, with rare pieces attracting very high prices at auction.